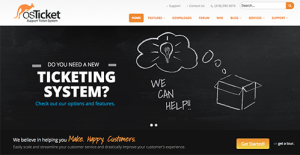 osTicket is a support ticket system built to improve your customer service and experience. Compatible with any operating system, it offers an array of features you need for your help desk solution. Some of its main features include custom fields, custom queues and columns, ticket filters, help topics, agent collision avoidance, auto-responders, thread action, service level agreements, customer portal, and advanced search, among others. The software is ready-to-use so you can immediately start using its support solutions right after downloading and installation. It has a free open source platform that you can use, modify and share. Meanwhile, it also has a cloud-hosted solution that doesn’t require installation and is offered on a monthly subscription basis. An enterprise solution is available that can be deployed on the vendor’s private cloud-hosting platform or on-premise. In order to immediately head straight to the issue, you can customize forms, fields and lists of data during ticket submission for customers to choose from. Meanwhile, you can also specify the criteria for the ticket queuing to give you control over the information you want to see. Routing tickets to the right agent or department is streamlined. You can also set triggered actions like sending automated canned response and ticket rejection, among others. Help topics are also configurable to accelerate response time. As soons as a message is opened or received, auto responses with personalization are sent to immediately engage your client. They can be customized and modified for each department and configured to address the recipient personally. Users register for a profile and log in to access their tickets and archived responses. They can also look for answers independently through self-service help desk. Building your own knowledgebase is streamlined. Every company has different requirements and requires a software that can be customized for their size, kind of workers and clients, and the specific industry they are in. For these reasons, no platform can proffer perfect features off-the-shelf. When you look for a software product, first be sure what you need it for. Read some osTicket reviews and ask yourself do you desire basic functionality or do you require advanced features? Are there any industry-specific features that you are seeking? Get the answers to these queries to aid your search. There are lots of elements that you need to consider and these include your budget, particular business requirements, your organization size, integration needs etc. Take your time, check out a few free trials, and finally zero in on the system that provides all that you need to improve your company competence and productivity. How Much Does osTicket Cost? We realize that when you make a decision to buy Help Desk Software it’s important not only to see how experts evaluate it in their reviews, but also to find out if the real people and companies that buy it are actually satisfied with the product. That’s why we’ve created our behavior-based Customer Satisfaction Algorithm™ that gathers customer reviews, comments and osTicket reviews across a wide range of social media sites. The data is then presented in an easy to digest form showing how many people had positive and negative experience with osTicket. With that information at hand you should be equipped to make an informed buying decision that you won’t regret. Perfect for whatever it is we need. My primary go-to helpdesk platform. A cheaper option compared to the pricey ones in the market. What are osTicket pricing details? What integrations are available for osTicket? Pros: OS Ticket has a developer community and user base that are both experienced and established. We were able to have the OS Ticket implemtations setup from within for clients to utilize. It functions impressively well with the Helpdesk system. It has all the basic functionality we need. Cons: Its older versions suffered badly as a result of its poor version techniques and certain spaghetti code. Thing is, great strides were made in getting the code in meeting today's standards. But then again, this only becomes relevant if you're making comprehensive system modifications. With the latest hosted systems offerings and a wide range of functionality, this isn't usually a huge problem for a majority of end-users. Pros: It has everything we want in giving a hand to our customers. It's a thing of beauty. We're using it as our basic ticket system along with its classifications. It also has a functioning knowledge base. Cons: As of this writing, we have yet to spot anything negative. It basically covers all bases. An open-sourced helpdesk with a traditional design. A fantastic open-source ticket solution for everyone. If you need more information about osTicket or you simply have a question let us know what you need and we’ll forward your request directly to the vendor.